In Gateway to Freedom: The Hidden History of the Underground Railroad, Pulitzer Prize winning historian Eric Foner sets out to rescue the legendary “Underground Railroad” from both oblivion and revisionism, and generally succeeds in this effort. Long a staple of antebellum tales of daring-do inside and out of the classroom, Foner’s overview of its historiography reveals that the Underground Railroad has been both extolled as an effort largely by white abolitionists to help fugitive slaves to freedom and pilloried as a myth that unfairly deprives credit to the overwhelming numbers of self-emancipating African-Americans who made it entirely on their own or with the random assistance of the free black population along the way. Most recently, some have argued that the entire concept of an Underground Railroad was nothing more than romanticized myth. In this well-written, well-documented history, Foner first demolishes the latter allegation as without basis and then neatly demonstrates – in a narrative frequently peppered with personal accounts — that not only was the Underground Railroad very much a reality that was indeed responsible for ensuring the freedom from recapture for thousands of escaped slaves from the upper South over many years, but that it was deftly piloted both by dedicated white abolitionists and free blacks who worked closely together far more often than has been revealed in previous accounts. While the geography of Gateway to Freedom surveys locales like Pennsylvania, Boston and upstate New York, it is set primarily in New York City in the final decades leading up to the Civil War, a largely unfriendly atmosphere for fugitive slaves due to the strong economic ties between the port city and the slave south. Yet, there was a vibrant network of free blacks and white abolitionists who approached the task of rescuing slaves seeking their freedom with an almost religious fervor. The state of New York – more sympathetic to the cause than the city – enacted laws that declared any non-fugitive brought to the state by their owner automatically set free, and evolving personal liberty laws that guaranteed a role for the courts in rendition, which acted as a certain kind of uneasy shield against an overtly hostile city government unwilling to damage trade ties by turning New York City into an escape hatch for runaways. Of course, as Foner relates with some detail, many slaves destined to run away were not treated well by any definition. Indeed, a good number fled simply for an opportunity to be free rather than enslaved, but tales of brutality abound, including beatings and deprivation of food and basic needs. There is an account of one stripped naked and flogged severely. Another who witnessed his own brother shot dead by their owner for resisting a beating. Many women became fugitives to spirit their children to safety when word leaked out that an impending sale of their offspring was on the horizon. In one poignant story, we learn of Eliza Manokey, a forty-two year old slave from Delaware who was often deprived of food and clothing and routinely flogged, who witnessed her four year old son being presented as a gift to the owner’s nephew for transit to Missouri: “… the boy clung frantically to his mother … but in vain.” Apologists for the south who rally to the myth of the “Lost Cause” notwithstanding, cruelty seems to have been institutionalized in the slave states, even if every owner was not a monster. This is most apparent in the punishments for recaptured runaways, as in the case of a successful rendition that returned a fugitive to his master, who subsequently had him tied and whipped in a public forum before selling him. It is difficult not to hold the witnesses to this brutal treatment unashamedly meted out in public – and by extension the entire slave south – complicit in such unspeakable acts that clearly put the lie to such unbelievable claims as that by the Richmond Whig that slaves in the south “. . . are the happiest and best cared for laboring population in the world.” If slaves were not, like Uncle Tom — the eponymous protagonist of the Stowe novel – routinely beaten to death, there seemed to be little shelter from arbitrary treatment in a system that at its core and on its best behavior was inhumane. White abolitionists and particularly their free black associates took tremendous risks, especially in making forays to the south to effect escapes of slaves rather than only assisting them once they had already made their way to free soil. Gateway to Freedom reveals acts of tremendous courage by these intrepid engineers of the Underground Railroad. On the other hand, Foner like any fine historian brings nuance and complexity to the narrative, uncovering the bickering, disputes and even fracturing of the abolition movement which at last led to a schism between those loyal to the often volatile famous Boston pacifist William Lloyd Garrison and those in New York’s abolitionist camp with wealthy elite businessman Lewis Tappan, who took a somewhat more vigorous approach to assisting fugitive slaves. In retrospect, some of their squabbles seem so banal as to be reminiscent of the ludicrous hostility of the “People’s Front of Judea” for the “Judean People’s Front” in the Monty Python comic masterpiece, Life of Brian, but these men were driven by ideological and moral imperatives, so even if hardly sensible under the circumstances, we must forgive their quarrels if only because their mutual intentions were indeed admirable. Gateway to Freedom is so pregnant with detail as to run dry in parts, although the account is often rescued by stirring tales of the enslaved struggling to be free and their saviors, white and black. Yet, the sheer number of escapees cited only further swells an already large cast of characters dominated by abolitionists on and off stage. An appendix with an alphabetical list would be helpful to the reader. Also, more of a quibble than a complaint, I suppose, the narrative is not nearly as compelling as it might have been if it was not written both for an academic and a popular audience, so the flow of the storyline is frequently and unevenly interrupted by commentary in quotation marks which adds pauses the reader might wish were not present. 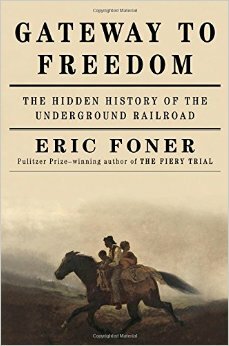 Still, Foner has done a masterful job with his subject: anyone interested not only in the Underground Railroad but also in slavery and abolition in the antebellum era should be encouraged to read this fine work. Nice job, Stan. This is a well-written review of a well-written book. I found particularly insightful Foner’s treatment of the complex relationship between the two main anti-slavery groups in NYC — how they broke apart over seemingly petty differences, but continued to work together, in some cases, for the greater cause. I love the phrase Foner borrowed from Sigmund Freud: “the narcissism of small differences”. I suspect this will be a theme of the next book up on my reading list: Bruce Laurie’s treatment of the abolitionist movement in Northampton and Florence. I suspect Bruce Laurie’s book may turn this into a quadrilogy.